Agustín Guillamón's short biography of Josep Rebull, POUM militant and opponent of that party's collaboration with the Catalan government during the Spanish Revolution. Originally an introductory part of "La izquierda del POUM en Mayo de 1937: Militancia y pensamiento político de Josep Rebull"
Josep Rebull Cabré was born in Tivissa (Tarragona) in 1906. His entry into social struggles followed the example of his older brother, the well known POUM militant Daniel Rebull (“David Rey”)<fn>There is a photo in which “David Rey” appears together with Trotsky, already in Mexico in January 1937. Daniel Rebull participated in all the social struggles from 1915 to franquismo, in the CNT, BOC and the POUM. He spent long periods in jail, 19 years throughout his life. Condemned to death under Franco, his sentence was later commuted.</fn> He was 11 when arrested for the first time, in his brother’s house in Barcelona, as a result of the general strike of 1917.<fn>The detention of a minor caused a scandal and made the newspapers at the time.</fn> He joined the Communist Party in Tarragona in 1927, during the Primo de Rivera dictatorship, while completing his military service. In 1932 he was a militant, and one of the founders, of the Bloc Ober i Comperol (BOC – The Workers and Peasants Bloc) in Tarrasa. After effective work in the press of that organization he participated in the founding of the POUM [The Workers’ Party of Marxist Unification – a fusion of the BOC with the Izquierda Communista de España, The Spanish Communist Left] in Las Planas in September 1935.<fn>Josep Rebull affirms that the foundation of the POUM took place in September 1935 in Las Planas (a popular picnic site close to Barcelona). Francisco De Cabo presents a different version. The versions are not contradictory but refer to two different and complimentary foundational acts of the POUM, one of a mass character, in which the militants of the BOC approved the foundation of the POUM, as narrated by Rebull, and the other more restricted and informal, in which militants of the BOC and ICE met, as related by De Cabo.</fn> In February 1936 he appeared on the electoral lists of the POUM in Tarragona. 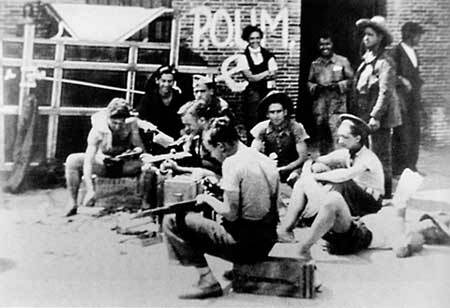 During the revolutionary events of July 19th 1936, Rebull took part in the street fighting in Barcelona’s Plaza de Cataluña with a group of a hundred militants, among whom were Carmel Rosa (‘Roc’), Rovira, Algemir, Vidal etc. Despite finding himself next to Germinal Vidal, secretary of the Communist Youth (JCI) who was killed in a confrontation with a military squad with whom they were parleying in the Plaza de Universidad, Rebull escaped unharmed. Taking over the administration of the requisitioned press of the Catalan El Correo, Rebull organised the press of the POUM and the output of the Editorial Marxista. Gaston Davoust, leader of the French group ‘Union Communiste’, spent three weeks in Barcelona, in the months of August and September 1936, during which time he carried out various interviews with anarchist leaders and the POUM, and began his friendship with Josep Rebull. On 21st July the CNT and the POUM supported the formation in Cataluña of the Central Committee of Antifascist Militias (CCMA) in which representatives of the bourgeois parties also participated. On 26th September Andreu Nin, political secretary of the POUM, without consulting the party membership, accepted the charge of the Ministry of Justice in the government of the Generalitat, retaining the position until his expulsion on 13th December as a result of Stalinist pressure. 1st October 1936 produced the self-dissolution of the CCMA, on 9th October the Generaliat, with the participation of the POUM and the CNT, decreed the dissolution of the local committees that were to be substituted by Popular Front local governments. On 13th October a decree elaborated and signed by Nin himself swept away the revolutionary work of Barriobero in the justice tribunals, on 24th October he approved the decrees of militarization of the Peoples’ Militias and the control of public order by a Council of Internal Security. In March 1937 a wide section of POUM militants protested at the lack of internal discussion and the most recent postponement of their congress, which had been put off in December 1936, February ’37, and again in March. In March and April the weekly meetings of the political secretaries and the organization of the district committees, in which the cells of the party were organized, expressed the discontent of the rank and file. Thus the local committee (CL) of Barcelona became a strong body of opposition to the POUM leadership, calling for the congress and beginning a debate about political work at the front, which went against the rules about the formation of cells in the militia, and also about the participation of the party in a bourgeois government, supposedly against the strategy hitherto followed by the Central Executive (CE).<fn>Correspondence between “Negrete” [Russell Blackwell] and “Oehler, 1936-37 [exact photocopies of the letters written by “Negrete”, the majority to “Oehler”, dated Barcelona between 26/11/36 and 4/11/37. Access to documentation facilitated by Andy Durgan, for whose generosity we are grateful.</fn> On 13th April, as the culmination of these acts of protest, the product of widespread unrest at the militant base of the party, a meeting was held between the CL of Barcelona and the Central Committee, at which Josep Martí, secretary of the CL, and Josep Rebull achieved approval for and wide distribution of the manifesto of the Barcelona CL, published in La Batalla on 15th April.<fn>This manifesto is reproduced in Balance, nº 19.</fn> This contained reference to the crisis of the Generalitat, criticizing the collaboration of the POUM with that government, and calling for the formation of a Workers’ Revolutionary Front that would enshrine workers’ councils as organs of power. It also announced the new convocation of the 2nd Congress of the party for 8th May, to give plenty of opportunity for the publication and distribution in the internal bulletins of the counter-theses of the different cells to the official thesis of the CE. Josep Rebull was the secretary of Cell 72 in Barcelona. The counter argument signed by Cell 72 (some 12 militants) that was published in the discussion bulletin of the 2nd Congress, edited by the Barcelona CL, was his work and did not originate but pick up on, deepen and theorise the contradictions and protests of the POUM’s militant base against the political strategy of the CE. That it was signed “Cell 72” rather than Josep Rebull was due simply to the requirements of the congress rules. During the May days Rebull was taken hostage by a Stalinist squad. He made three chief interventions in the events of those days, but he never called for the comrades of the CNT to take power, as affirmed in ‘The Spanish Civil War. The View from the Left’<fn>Revolutionary History, vol. 4, nos. ½.</fn> but limited himself to posing this question to the CE of his own party. An interview between Cell 72 and the Friends of Durruti Group (FOD) on the night of May 4th, at which it was decided not to take any initiative given the minority character of both organizations, and because they considered that the action the CNT were to take would be decisive. An interview with the CE of the POUM: Nin, Andrade and Gorkin, at which, with a map of Barcelona in his hand, he demonstrated the certainty of a military victory if the POUM decided to attack the government buildings in the centre of the city, to which the CE responded that they were dealing with a political rather than a military question: the taking of power would mean breaking anti-fascist unity and precipitate a rapid victory for Franco’s army. Ceding the POUM printing press to the FOD on 8th May so that they, no longer authorized by the CNT, could put out a manifesto that drew a balance sheet of the recent events. The serious events of these days, from 3rd to 7th May, made it impossible to convoke the POUM congress, again postponed until 19th June, in time for the international conference which was to be meeting on 19th July. The political tactics of the CE were widely criticized by a wide sector of its militants and Andreu Nin was probably on the point of being dismissed from his post as secretary. With the repression against the POUM, triggered on 16th June, the party closed ranks and the critics of the collaborationist policy, given the impossibility of convening the 2nd Congress, were provisionally silent. Rebull found himself isolated as the rest of the members of Cell 72 failed to stick by their positions. Consequently, with the possibility of convening a congress definitively ruled out, the so called Left of the POUM in Barcelona had only one militant at the beginning of 1938: Josep Rebull.<fn>In number 3 of La Voz Leninista (Feb 38) Munis strongly criticised the political action of Rebull because, while acknowledging the correctness of his political positions and his critique of the CE of the POUM, he never broke with the organisation. In Munis’s opinion Rebull lacked the decisiveness to follow his ideas to their logical conclusion, the courage to break with the POUM and join the 4th International.</fn> For one year he lived clandestinely in Barcelona, occupying alternately Joaqín Maurín´s flat on Calle Padua or a rented room on Calle Llibretaria. Until April he was continuously active in the editing and distribution of the POUM’s clandestine press; as well as in giving solidarity and help to prisoners through assiduous visits to Irujo, the Minister of Justice, to achieve the transfer of POUM militants from the Stalinist Cheka prisons (where they could disappear without trace) to republican prisons. But with the omnipresent Stalinist repression against POUM militants, and the growing difficulty in avoiding military enrolment, he was enlisted in the army under a false name at the end of 1938. The episode of the Committee of Defence of the 2nd Congress of the POUM, in July 1939, halfway between the end of the civil war and the beginning of World War 2, although it involved the cropping up of a Bolshevik-Leninist group in the POUM, and a certain collaboration of this group with Rebull, was neither profound nor prolonged enough as to win Rebull to the Fourth International. The thesis defended by Cell 72, that cannot be categorized as either Trotskyist or Councilist, highlighted the contradiction in the CE of the POUM between theory and practice, as, according to Rebull, it theorized the formation of a workers’ government while at the same time sustaining and strengthening the bourgeois government of the Generalitat. Having crossed the French border in February 1939, Rebull spent some months in Paris in the house of Gaston Davoust (“H. Chazé”). After the Nazi invasion he was in Marseilles for two years, living clandestinely and without papers, with exiled Italian Bordiguists such as Mitchell, Marco and Tuilo, people of great solidarity and no less intransigence in their political analysis. For some months he worked, like so many other exiles of the extreme left of all nationalities, in the confiture factory Croque-Fruit, managed by Trotskyists. While in Marseilles he became friends with the writer Jean Malaquais, his neighbor in Air-Bel. In the summer of 1943 he intervened in the French Resistance, until his arrest by the Gestapo and his eventual liberation in 1944. During his long French exile he got by as the administrator of a small publishing house and a journalist for Franc-Tireur, which later adopted the new name of Paris Jour. Rebull was a member of the CE of the POUM in exile until May 1953, when he tendered his resignation as a result of political disagreements with the remainder of the body.<fn>Rebull, Josep: “Letter to the CE of the POUM” (Paris, 19/5/53)</fn> From that time he remained as a grassroots militant, although more and more removed from active militancy, while nevertheless remaining interested in political and economic analysis. Rebull had a good innings. Long since retired in the beautiful Rosellón village of Banyuls-sur-mer, he died in his 90s on 22nd May 1999.